Welcome to colorful Colorado, home of ghostly hotels, city parks, and, of course, some of the best mountain viewing around. Author Kailyn Lamb looks at locations throughout the state and dives headfirst into the history behind the ghosts and what has made them stay. The eyes of paranormal enthusiasts have long been on the Centennial State due to the fame that Stephen King’s The Shining brought to the Stanley Hotel in Estes Park. The Stanley, however, is not the only haunted hotel in Colorado. Multiple inns and hotels (some of them brothels) in Denver alone have histories as sites of deaths that make their victims decide to stay in their beloved rooms forever. Ghosthunting Colorado is the latest book in the popular America’s Haunted Road Trip Series. The guide covers 30 haunted locations in Colorado. Each site includes a combination of history, haunted lore and phenomena, and practical visitation information. About the author: Kailyn Lamb holds a degree in journalism from Mississippi State University. She has always had a fascination with otherworldly things; she devours horror movies, Stephen King novels, and ghost stories as often as she can. 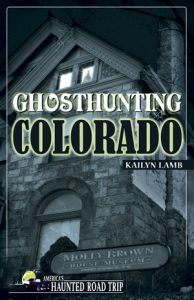 Kailyn lives in Denver, CO.
About the series: America’s Haunted Road Trip is a one-of-a-kind series of haunted travel guides. Each book profiles 30 haunted places that are open to the public. The author visits each place, from inns and museums to cemeteries and theaters, interviewing people who live and work there. Also included are travel instructions, maps, and an appendix of many more places that the reader can visit.